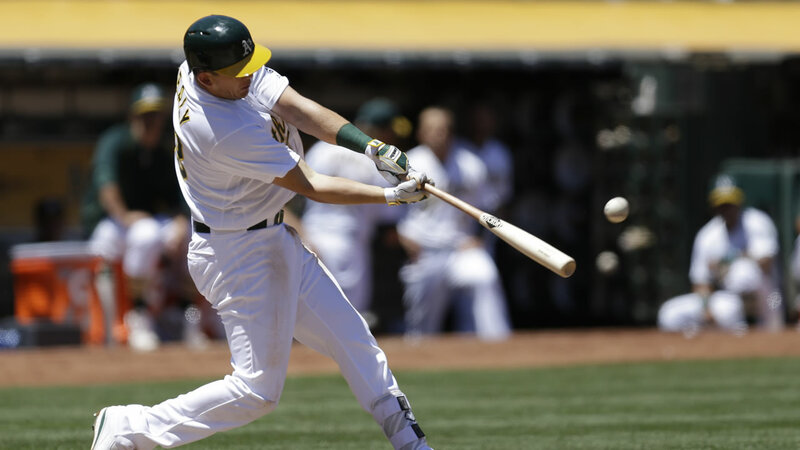 OAKLAND, Calif. -- Khris Davis hit two home runs, Ryon Healy hit his first career homer and Sonny Gray snapped a 12-game winless streak as the Oakland Athletics defeated the Toronto Blue Jays 5-4 on Saturday. Davis was 2 for 4 in his ninth career multi-homer game, three of which came this season. The A's have homered six times in two games, three of them by Davis. Gray (4-8) ended a career-worst seven game skid. He was 0-7 with a 6.16 ERA over his previous 12 starts. He allowed three runs on six hits and four walks in six innings. The 24-year-old Healy, playing in his second game since being called up from Triple-A Sacramento for the first time on Friday, crushed a 66 mph pitch off R.A. Dickey (7-10) for his first major league hit. Dickey allowed five runs on five hits, including 3 homers, and three walks in six innings.